100% REMY HUMAN HAIR. Hair extensions delivered direct to your door. YOUR FREE COLOUR MATCH. Let us find your perfect match. ULTIMATE DOUBLE WEFTED: Clip in Hair Extensions. If you’re after maximum volume and glamour, look no further! Our ULTIMATE Double Deluxe Full Head sets are perfect for achieving luxurious celebrity-worthy locks – Ultimate Volume – Ultimate Style! Each ULTIMATE Double Deluxe Clip In Hair Extensions set includes 10 weft pieces (thats 2 more than our Deluxe sets) with pre-attached feather light silicone clips that will not slip or pull. Each piece is double wefted – this means you receive almost three times the amount of hair without having to pay three times the price of a full head. 2 x 8″ wide weft (4 clips attached) 2 x 6″ wide weft (3 clips attached) 2 x 4″ wide weft (2 clips attached) 2 x 3″ wide weft (2 clips attached) 2 x 2 wide weft (1 clip attached). 100% REMY HUMAN HAIR ULTIMATE DELUXE DOUBLE WEFTED. 18″(46CM), 20″(50CM), 24(61CM). 18″(190g), 20″(205g), 24(230g). CAN BE CURLED, STRAIGHTENED, WASHED AND DYED. All of our hair products are 100% human hair and certified. As such the hair products can be Straightened, Curled and Dyed but adequate care must be taken when doing so. Please follow these careful instructions in the Hair Care section for each of the above processes, not following these care guidelines can lead to damage of the hair product and this is in no way a result of the quality of the product or in any way proof that the product is not 100% real human. These products do not belong to and are not associated or affiliated with Lush Ltd or Lush Cosmetics. #1 – Jet Black, #1b – Natural Black, #2 – Darkest Brown, #4 – Dark Brown, #5 – Brown, #6 – Medium Brown, #8 – Light Brown, #10 – Lightest Brown, #30 – Light Auburn, #33 – Dark Auburn, #99j Deep Red Wine, #4/27 – Dark Brown / Caramel Mix, #6/27 – Medium Brown / Caramel Mix, #8/27 – Light Brown / Caramel Mix, #4/613 – Dark Brown / Bleach Blonde, #6/613 – Medium Brown / Bleach Blonde, #8/613 – Light Brown / Bleach Blonde, #16/613 – Blonde Highlights, #18/613 – Blonde / Bleach Blonde Mix, #27/613 – Caramel / Bleach Blonde Mix, #18 – Strawberry Blonde, #24 – Golden Blonde, #613 – Bleach Blonde, #60 – Lightest Blonde, RED, PINK. Unsure which colour to choose? If you have looked at our colour chart and you are still unsure which colour to choose! Don’t worry we have a dedicated professional team who will advise the perfect colour for you. Free Colour Matching Service. All orders placed before 2pm will be dispatched the same day. Helpful tips to care for your hair extensions. Washing – When washing Lush Hair Extensions please use a low PH shampoo and a good conditioner on the hair, wash in tepid water and hold around the clips. Let the hair dry naturally before styling using a little hair serum. To prolong the life of the extensions try not to wash too often and use products like dry shampoo or hair perfume to freshen the hair. Straightening / Curling – Our hair can be straightened and curled. Human hair can be heated to a maximum of 180 degrees. If the hair extensions are heated above this temperature it may cause damage to the hair. It is not advised to use heat protect spray on the hair extensions. FULL HEAD: Clip in Hair Extensions. Our most popular range of clip in extensions! Great for adding length and volume with an affordable price tag. This clip in set is a standard full head set ideal for those with fine to medium hair. We offer a wide range of real human clip-in hair extensions, please see’ other products you may be interested in’ below, to ensure our standard full head set is the right set for you. 1 x 8″ wide weft (4 clips attached) 2 x 6″ wide weft (3 clips attached) 2 x 4″ wide weft (2 clips attached) 1 x 3″ wide weft (2 clips attached) 2 x 2 wide weft (1 clip attached). 12″(30CM), 15″(38CM), 18″(46CM), 20″(50CM), 22″(56CM), 24″(61CM), 26(66CM). 12″(70g), 15″(75g), 18″(85g), 20″(95g), 22″(100g), 24″(105g), 26(110g). All orders placed before 3pm will be dispatched the same day. Dyeing – As with all Human Hair extensions our hair extensions can be dyed. However it is recommended to perform a strip test on a small piece of the hair first. Once hair has been dyed we cannot be held responsible for the dyeing process. OTHER PRODUCTS YOU MAY BE INTERESTED IN. 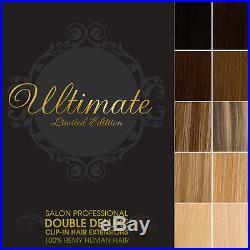 ULTIMATE DOUBLE DELUXE: Clip in Hair Extensions. DELUXE DOUBLE WEFTED: Clip in Hair Extensions. If you’re after more volume and glamour, look no further! Our Deluxe sets are perfect for achieving luxurious celebrity-worthy locks – Kim Kardashian, eat your heart out! Each piece is double wefted – this means you receive almost twice the amount of hair without having to pay twice the price of a full head. HALF HEAD: Clip in Hair Extensions. Are you looking to add a bit more volume and life to your current set of hair extensions? Or maybe you’re in need of a bit more length for a quick up do? Our Half Head Clip in Hair Extensions are for you! DELUXE DOUBLE WEFTED DIY WEFT: Hair Extensions. Our Deluxe sets are perfect for achieving luxurious celebrity-worthy locks. EAch piece is double wefted – this means you receive almost twice the amount of hair without having to pay twice the price of a full head. DIY WEFT: Hair Extensions. Have your own Ideas? Our DIY Weft hair extensions are for you. Our DIY Weft sets contain a single 36 inch (3 feet) wide weft of hair which can be transformed into your own custom set of hair extensions or even weaved in as a more permanent fixture to your hair. We also include 18 of our clips with the set so you can sew these on quickly and with ease when making your own individual set of clip-in extensions. The item “Lush Hair Extensions Ultimate Deluxe Double Wefted Clip In Remy Human Hair” is in sale since Thursday, July 4, 2013. This item is in the category “Health & Beauty\Hair Care & Styling\Hair Extensions & Wigs\Hair Extensions”. The seller is “hairproductssurrey” and is located in Kingston upon Thames. This item can be shipped to North, South, or Latin America, all countries in Europe, all countries in continental Asia, Australia.